I'm going to let you in on a little secret today: The best appetizer that I know how to make is super simple to prepare, only requires two ingredients, and it wows guests every time I serve it. 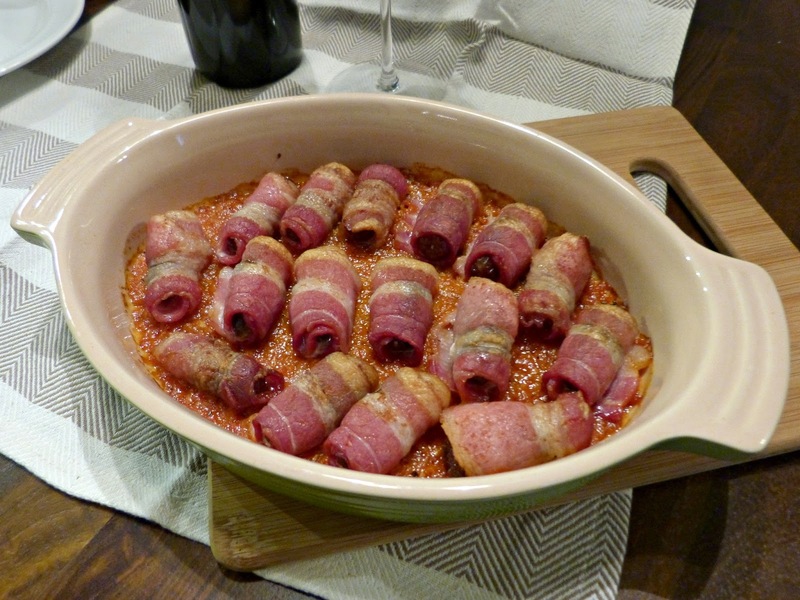 Ladies and gentlemen, meet bacon-wrapped dates! There isn't a whole lot to say about this recipe since it is so very simple to make except that it's a perfect combination of sweet and salty in one easy to serve and eat little bite. I tried these for the first time during my first visit to a tapas restaurant years ago and was immediately hooked. Alex loves them so much that we also served them at our wedding cocktail hour. So, when Las Rocas reached out to me to give a bottle of their Spanish Garnacha wine a try, I knew exactly what I wanted to pair it with for an impromptu tapas-inspired cocktail hour at our place! Garnacha is the second most planted red wine grape variety in Spain. Las Rocas Garnacha is grown in the wine region of Calatayud, which covers 5,600 acres and produces approximately 14 million liters (19,000 bottles) of wine each year. Calatayud is known for its abundance of high elevation Garnacha vineyards— the highest in the entire country. The bulk of Spain’s Garnacha is planted in the Calatayud, Campo de Borja, and Cariñena regions. As in the case of neighboring Campo de Borja and Cariñena, Garnacha is the dominant grape in Calatayud in terms of area. Garnacha is known by many names depending on region including: Garnacha or Garnatxa in Spain, Grenache in the US and France, and Cannonau in Italy. Garnacha is one of the wine world’s hardest-working, highest-yielding, latest-ripening grapes. It is praised for being resistant to the elements like heat and wind. Garnacha ripens late in the season, so it needs a hot, dry, stony hillside condition to flourish. The taste of Garnacha can be easily altered during the winemaking process and as a result is rarely aged in oak barrels. Suggested food pairings for Garnacha include: roasted meats, vegetables, ethnic foods, and spicy foods. Preheat oven to 425 degrees. Line a rimmed baking sheet with aluminum foil and place a wire rack on top. Wrap a half slice of bacon tightly around each date and place on the wire rack with the loose end of the bacon on the bottom. Bake for 20-25 minutes or until bacon is cooked and crispy. Bacon-wrapped dates are delicious as is, but if you want to jazz them up a bit I have a few suggestions for additional ingredients to add a little more flavor to this super simple snack. Use a small sharp knife to cut a slit lengthwise on each date to create a pocket. Stuff with a little cheese or with a pecan half or almond, wrap with bacon and then continue with baking instructions above. Balsamic reduction-- Drizzle a little balsamic reduction over the cooked dates just before serving for a little tangy sweetness. 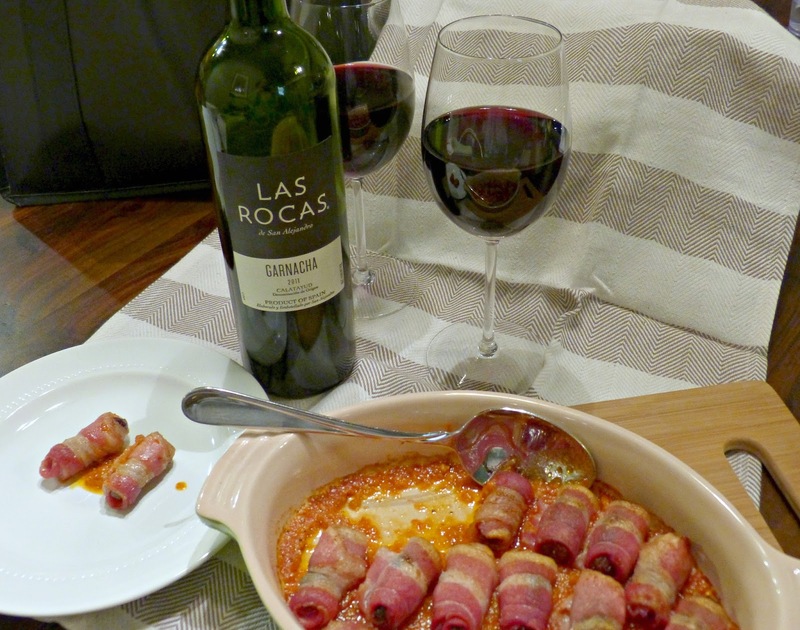 Editor's Note: A sample of Las Rocas Garnacha was provided to me at no cost. The opinions expressed herein are my own. Thank you for supporting the brands that support A Squared! I ordered salmon to share with my friend and I ordered a few things at San Francisco restaurants. I thought the salmon was a bit too salty but the crab cakes were so delicious. But most importantly, I'm really happy with the customer service I got.